Care and housing specialist, Bield has seen the news of its innovative new scheme to expand its home care service feature in The West Lothian Courier. 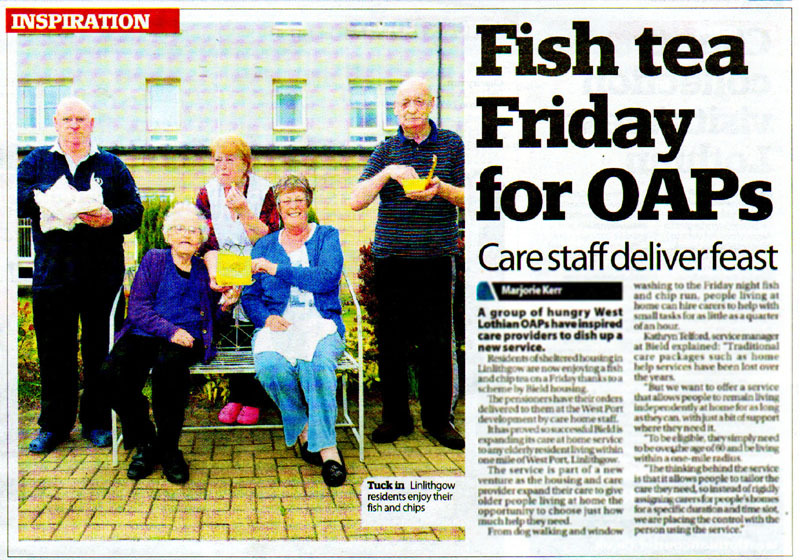 Inspired by a group of residents at Bield’s West Port development in Linlithgow, carers are extending the Friday night fish and chips service to those living out with the home. Now any older resident living within a mile radius of the home is eligible for this service. This comes as part a wider initiative to improve its care at home service. Older pople living at home are able to choose exactly how much care they require, and are able to hire carers for household tasks that take up as little as fifteen minutes. The West Lothian Courier, covering the local West Lothian news as well as national news, displayed this story with a half page spread, that we read by around 13,000 recipients. The coverage was achieved as part of an ongoing PR campaign by Holyrood PR– the full story can be found in the original press release.